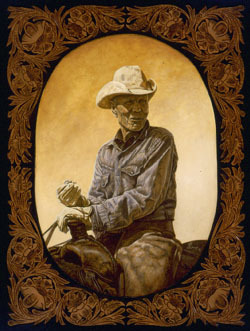 "CURTIS" This is a painting done of a contemporary ranch owner/cowboy in Meeteetse, Wyoming. The original painting was mounted with a hand tooled leather mat. "Curtis" now 85 years old, still rides horses working cattle. This is a limited edition of 50 prints signed and numbered by the artist. The image size is 12"x16". print comes mounted on archival foam core ready for framing. The price is $275.00 plus $30.00 shipping.